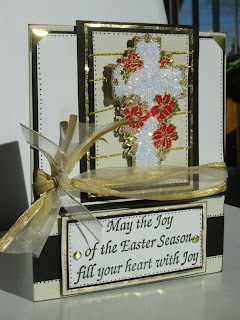 I love how the sunlight captures the look of the embossed cross here. The flowers I colored in with LePlume markers. The cross is framed and mounted with foam adhesives and wrapped with gold thread. My husband thinks there are too many "joys" on this sentiment, but thats how the stamp was designed. I cant do anything about that saying. Its still a beautiful greeting - dont you think?